Sea turtles have been harvested in the Wider Caribbean Region for millennia. Evidence of use and trade can be found in the region’s earliest written history, as well as from archeological sites. 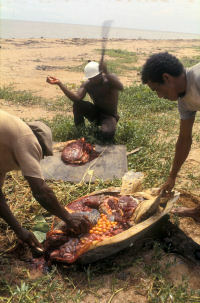 Most sea turtle parts are of potential domestic or commercial value – the shell can be used for jewellery, ornamentation, and utility (e.g., carved into fish-hooks); the skin of the flippers and neck can be tanned and used for leather articles; the meat and eggs are consumed; the offal, calipee, and bones form the basis of turtle soup; the oil is used medicinally, as a lubricant, and as a cosmetic base. Turtles are also stuffed whole as curios. 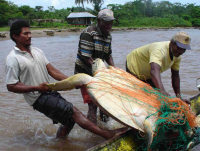 Caribbean fishers typically land sea turtles through the use of nets or spears. Hunters kill adult females and collect eggs from the region’s nesting beaches. A large majority of Caribbean governments protect sea turtles by law at all times of the year. Where legal fisheries still operate, the typically unmonitored harvest operates within certain constraints (e.g., size restrictions, seasonal closures) but without any data-based information on whether the take is sustainable. With the exception of Cayman Islands (which recently adopted a maximum size limit), legal fisheries enforce a minimum size limit (by weight or shell length) that targets large juveniles and adults in contradistinction to the best available science on population recovery. Available data implicate direct harvest in the demise of nesting and foraging populations throughout the region. Since sea turtles are migratory at all life stages, these declines can result from a combination of factors, both domestic and foreign. In some cases the statistics are staggering – for example, current hawksbill populations in the Caribbean are estimated to represent at most 10of pre-Columbian levels – and have led prominent sea turtle scientists to characterize sea turtles as “virtually extinct” from the standpoint of their role in Caribbean marine ecosystems. Despite long-term downward trends and many localized extinctions (e.g., nesting beaches that are no longer visited), recent evidence of recovery in some areas, particularly among small, well-protected populations, is welcome news to community-based conservationists, progressive policy-makers, and sea turtle scientists, many of whom have devoted their lives to increasing the survival prospects of these ancient species. In addition, while poaching remains a serious issue in some countries, community-level models are increasingly identifying poachers as willing to leave the old ways behind and showing themselves to be productive and dependable participants in research, conservation, and tour guiding initiatives.